CT-NY-PA-MI-WA-FL-CA, to my Father, Paul M Hoyt. 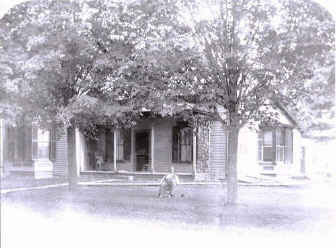 "a legacy for your family"
This is an Historical Account of the 319 Clark Street address, in Village of Clinton, Michigan. or by E-mail. This home is one of the Oldest in Clinton Michigan, as well as, the County of Lenawee. purchased by Henry Ford and moved to Greenfield Village where is open for public display, as the Eagle Tavern. Business's still operating the Original Business. the tail race, In which this property is now known as, Water Works Park. Societies wall in 1975, showed a black square in the parcel shown on Clark Street in this 1845 Edition Plat Map. and went only ? of current depth of home. A very old stairway went up E to W, in 1800's, it was changed from N. to S.
adjacent beams by wooden pegs of an inch plus, in width, driven into corner trusses. these windows are still intact, it used to fun to make faces in them, out to others outside, playing as children. above the Main Parlor and Master bedroom. part & North Attic wall, shows their names dated as 1872. Elm used to cool the Summer heat into the West side of the home where the North bedroom and Kitchen parlor was. This was cut down after many scary days of these large branches threatened to come into the home in the 1960's. as my folks never used it to store a vehicle, after the 1960's. Dearborn, Michigan. They moved on May 8th, 1947, just 40 days before we twins were born.WOW!! address was sold in 1979 for $45,000.00, nearly, a 750% profit, in 32 years. prices at the grocery store, and helped my parents budget. managed to slide down on cardboard pieces, as well as, boxes to have a short thrill. His residence was more like a Garage, but a home. Bill Peeper's would fry us fried potatoes and onions. He would give use tomatoes and corn from his garden. Dad always would give him a bottle of whisky for Christmas. from smoke inhalation due to him falling asleep with a cigar. have to embrace for the "Winds to blow us into Dust!" recently held For Sale in Summer 2002. They will be completely restoring the old home to it's Grander Days.